You may have noticed a bit of water on your floor or a stain on your ceiling and realize that you have a roof leak. When a roof leak occurs at your home getting it fixed as quickly as possible is a must. You can eliminate a lot of damage to the interior of the home if your roof leak is repaired in time and sometimes the only thing that is needed is a fresh coat of paint and roof repair in Howell Michigan to put things back correctly on your home. Of course, the longer a roof leak is allowed to leak the more damage it can do to your home. Especially when it starts raining more and more during the upcoming season. 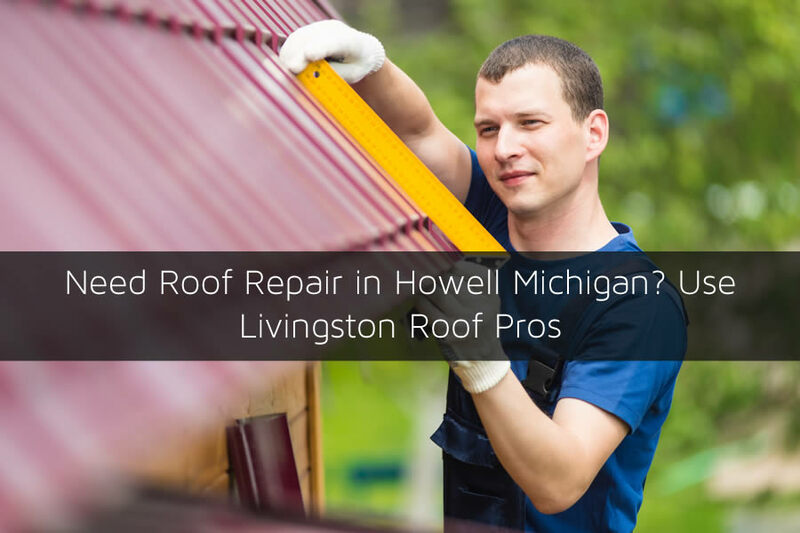 At Livingston Roof Pros we have roofing experts that are ready to take care of your roof repair in Howell needs. We have qualified roofing professionals that can help you get back to normal quickly. As you can see we cover a wide variety of roofing services. If you need a roofing service in Howell Michigan that isn’t listed above, be sure to contact us for more details. We would be glad to help answer any questions you may have about your home’s roof. Listed below are some of the reasons why we’re the number one roofing contractor in Howell Michigan. We’re a local company that is here to help when we can. We want to provide the best in customer service because we realize that without our customers, we’re not a business. That’s why our customers take top priority and we always go the extra mile to make sure they are completely satisfied with any of the roofing services we offer. If you’re not satisfied for any reason with any of the work we provide be sure to let us know and we’ll do everything we can to make it right. We’ve been part of this community for years and hope to be here for years to come and that’s why we provide such great customer service. After all, these aren’t just our customers but also our neighbors. Using a roofing contractor in Howell Michigan that isn’t fully licensed and qualified can lead to all sorts of problems for a home owner. One of the biggest problems may not show up for some time when you need it most. Having your roof installed by a roofing contractor that isn’t qualified and installs the roof wrong could void the warranty on your home’s roof. So even if you received a 40 year warranty on your roof it may not be honored by the roofing manufacturer. At Livingston Roof Pros we are fully licensed and qualified to install any of the roofing materials we offer to our customers. Give us a call today if you need a specific roofing material on your home for more details. When it comes to roofing, you’ll want someone who is experienced with the roofing system you have installed for making roof repairs in Howell Michigan. Many roofing contractors will often send inexperienced roofers to a home with a small roof leak. However, at Livingston Roof Pros, we always have an experienced roofing professional come to your home for roof repairs. This is also for specialty roofing systems as well. Although the most common roofing materials in Howell Michigan is asphalt shingles we can also cover a variety of other roofing materials and have experience with them as well including metal roofing, tile roofing, flat roofing, and more. If your roof is leaking and you need help be sure to call us today to get a free estimate on roof repair in Howell Michigan.